Looking for something a little less pedestrian than the average showroom-stock 911? Take your ideas and swatches to Porsche. 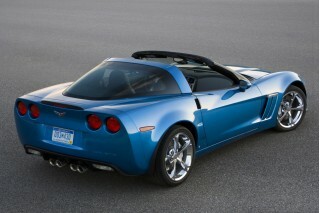 They're eager to please owners with a staggering array of optional colors and custom finishes-for a price. The 2010 Porsche 911 is an icon-as much for its teardrop shape, as for its startling performance. Since time immemorial-or was it the Sixties? Who can remember?-the Porsche 911 has been the outline for sports cars with its iconic teardrop shape and its iconoclastic handling. Never better than it is now, the 2010 Porsche 911 once again raises its own bar by dropping in a new Turbo model with faultless handling and urgent, propulsive boxer power. In coupe, Cabriolet, and Targa body styles, the 911 dazzles on many fronts. Porsche tempts with a choice of turbo and nonturbo flat-six engines; dual-clutch and manual transmissions; and rear- or all-wheel drive. Priced from $79,000 for a coupe to $145,000 for a Turbo Cabriolet-that's before options-the Porsche 911 occupies the same rare air as the Aston Martin V8 Vantage, the Jaguar XKR, the Chevrolet Corvette ZR1, and in a stretch, the Ferrari California. How do you describe a 911's styling, apart from "singular?" With more than 40 years behind it, the 911 doesn't answer too many requests to change with the times. It rolls on, like a Mustang, confident in merely refining its classic shape, year after year. Sure, the Turbo is a little wider and a little lower (and Turbo-look packages are sure to spread to other models after this year), but all 911s are squat little teardrops, with front fenders that frame a narrow, single-minded view of the road ahead. This year Porsche adds new mirrors, LED taillights, and exhausts, and Turbos get air intakes all over the place and an automatic rear spoiler-and still, a time traveler from 1965 would recognize this car as a Porsche. That's also true of the dashboard, which is a little less convincing with its newfangled LCD screen and dozens of buttons. Stark? Yes, it's still stark, and the ignition's still to the left of the steering column-but the delicious-looking Valrhona-brown leather trim available would shame an early vinyl-seated 911, or even some Audis, and the big LCD nods at all the modern conveniences even Porsche's fitting to its cars these days. Discerning between all the differently shaped ancillary switches can be distracting, but the large, clear gauges put the engine speed right in your sightlines. Whether it spins to 60 mph in less than 5.0 seconds or a little more than 3.0 seconds, every Porsche 911 breathes exhilarating performance. 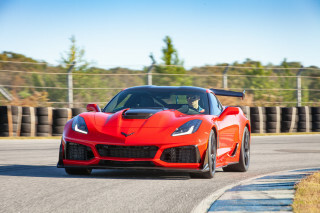 The essential 3.6-liter flat six is the foundation; with 345 horsepower and a muscular engine note hammering away behind you, it'll push the coupe to 60 mph in 4.7 seconds and won't let up until it hits 180 mph. That's with the obedient, somewhat stiff-shifting six-speed manual. It's stout, and it needs to be for all this power. For our money, Porsche's new dual-clutch, seven-speed "PDK" gearbox is the better choice. It uses a pair of transmissions to pre-select gears for upshifts and downshifts, and it's faster than any driver with even the world's easiest manual shifter. "Auto" mode is enhanced with Sport, Sport Plus, and Manual modes-giving you as much choice in gears as you need. It shaves 0.2 second off the acceleration times of most any 911, but drops top speed to 178 mph. With the PDK transmission, the 911 gets a mildly astonishing 19/27 mpg-a family-sedan fuel economy number. 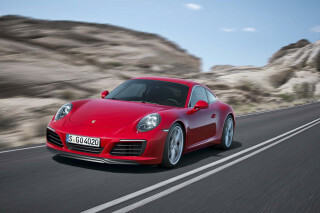 Other body styles and technical options boost or cut the 911's acceleration times. A Sport Chrono package remaps the fuel delivery and shift points in the PDK-equipped car, and drops acceleration times another 0.2 second, to 4.3 seconds. If you choose the Cabriolet body style, it's 0.2 second slower in general than the coupe; the glass-roofed Targa version adds 0.3 second to the stock coupe. 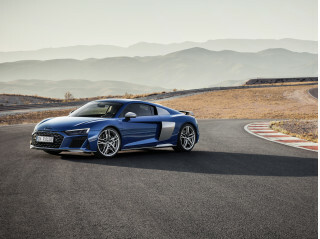 Add optional all-wheel drive, and you'll append another 0.1 second to the 60-mph run. Still, the slowest 911 Targa 4 will pass 60 mph in 5.0 seconds. The 911 offers a few alternatives for even more performance. 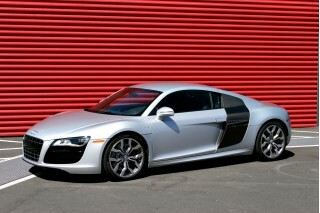 First up is the "S" model, propelled by a bigger 3.8-liter flat six with an additional 40 hp. Its 0-60 mph times falls to 4.5 seconds; the PDK, all-wheel-drive, Cabriolet, and Sport Chrono options adjust speed accordingly. With a manual transmission, the 911S Coupe will top out at 188 mph. Our review doesn't cover two racing editions of the 911, the GT3 and the GT3 RS. Both have distinct powertrains and drive systems adapted for racing, down to a lithium-ion battery for track starts. The elephant in the room is the new 2010 911 Turbo. The engine's new and dedicated to this model, and it shares direct injection and 3.8 liters of displacement with the 911 S. Only here, a pair of turbochargers dials up 500 hp and 480 pound-feet of torque-with 516 lb-ft on tap for "overboost" scenarios when the car's electronics decide some torque will smooth out a gearchange. The Turbo rushes to 60 mph in 3.2 short, blissful seconds via the PDK gearbox-a manual shifter adds a couple of tenths, but gets the better top speed-and presses upward to a 194-mph top speed. In any 911, the ride can be tough and not at all pliant-the price paid of all relatively compact sports cars with huge tires. The reward comes in steering sensitivity and ultimate grip. No matter which model you're piloting, the brilliantly responsive 911 keeps the neural, connected feel it's always had-even in cars fitted with active suspension dampers (oil-pressurized, computer-controlled shocks-they're standard on S and Turbo versions, and available on 911). The 911 just steers better than any sports car, period. Sport Chrono mode doesn't mess with its inherent goodness-it just dials up the drivetrain's intensity and clamps down on those shocks while they concentrate on staying flat and resisting body roll. Massive 18-, 19-, or 20-inch wheels give the 911 astounding grip, and some versions apply braking during tight corners to enhance their turn-in even more. The brakes, especially the bigger rotors on the Turbo and the optional carbon-ceramic discs, are like opening a parachute, and come with their own electronic assistants to make sure you get all the stopping power requested. What you find in any version, after any amount of driving time, is that there's no practical way to approach the 911's grip limits on the street. For comfort, it's up to you to choose plusher seats for your 911. If it were our car, we'd skip the nicely firm manual-slide, power-rake seats and move up to the 12-way power seats. They have memory positions, good back support, and optional ventilation, and they feel better on longer trips than the base or the super-firm sport seats. Some seats have adaptive cushioning, and inflate or deflate some air chambers on the go-which seems over the top. The 911's upright style lends lots of headroom to the front passengers, but that lovely, long slope to the tail and the rear-mounted engine turn the backseats into child's play. They're token gestures, not even large enough for small children. Use them for luggage-there's also a weekend-bag space under the front hood-and you'll be able to take it on a couples' vacation. Cabriolet versions are fitted with an impressively snug top and equipped with a heated glass rear window. Putting the top down is a one-button affair that snugly retracts the whole thing in just a few seconds and sends it back up in a few more. Targa models have a large glass sunroof that glides back for a more open-air driving experience, though it still retains a roof structure. No matter which body style, the 911 has a tightly constructed feel, and fit and finish top our rankings, with a few exceptions-like the flimsy flip-out cup holders hidden behind poorly fitted plastic trim in front. Neither NHTSA (National Highway Traffic Safety Administration) nor the IIHS (Insurance Institute for Highway Safety) has crash-tested the 2010 911 lineup. Dual front, side, and curtain airbags are standard, along with Porsche's excellent PSM stability control system, anti-lock braking, and brake assists to boost the driver's inputs and to keep the brakes dry for optimal stopping power. There are no fancy safety gadgets like lane-departure warning systems, backup cameras, or active cruise control available-but the 911's sheer performance is a safety net of its own, as is the available all-wheel drive. Visibility is acceptable on most versions, but the low seating position and the sharp drop-off on the rear quarters will make you think twice about backing up in dicey situations, particularly in the Cabriolet and Targa models. The expansive 911 lineup starts at $77,800 for a 911 Coupe. The 911 Cabriolet and 911 S tick upward to $88,800, while the 911 S Cabriolet is tagged at $99,800. The 911 Targa 4 and Targa 4S are priced from $90,400 and $101,100, respectively, while the 911 Turbo and Turbo Cabriolet sticker at $132,800 and $143,800, in that order. All cars are subject to a $950 destination charge. For that price, Porsche fits all cars with standard climate control; power windows, locks, and mirrors; cruise control; a tilting/telescoping steering wheel; Bluetooth connectivity; and an AM/FM/CD/DVD player. Upgrades will turn a pragmatic 911 shopper into a pauper: Options include Bose surround sound; a DVD changer; an iPod interface; a voice-activated navigation system with a 40GB hard drive; a multifunction steering wheel; adaptive headlights; ventilated seats; and daunting choices for interior wood, metallic, and leather trim. The 911 Turbo acquires some of this stuff as standard and gets distinct interior treatments with a leather dash and a sueded headliner. Want more on the performance front? You can opt for the active suspension; Sport Chrono; the PDK transmission; carbon-ceramic brakes; 19-inch wheels; sport paddle shifters; the PTV torque-vectoring system; and stylish RS-look wheels with center locks. All told, a 911 Turbo could cost almost $160,000 with just the factory features-never mind Porsche's embrace of off-the-menu ordering for colors and trim. The Porsche 911 rolls on as-is for another year, and history's still kind to its classic proportions. How do you describe a 911's styling, apart from "singular?" With more than 40 years behind it, the 911 doesn't answer too many requests to change with the times. It rolls on, like a Mustang, confident in merely refining its classic shape, year after year. Sure, the Turbo is a little wider and a little lower (and Turbo-look packages are sure to spread to other models after this year), but all 911s are squat little teardrops, with front fenders that frame a narrow, single-minded view of the road ahead. This year, Porsche adds new mirrors, LED taillights, and exhausts, and Turbos get air intakes all over the place and an automatic rear spoiler-and still, a time traveler from 1965 would recognize this car as a Porsche. That's also true of the dashboard, which is a little less convincing with its newfangled LCD screen and dozens of buttons. Stark? Yes, it's still stark, and the ignition's still to the left of the steering column-but the delicious-looking Valrhona-brown leather trim available would shame an early vinyl-seated 911, or even some Audis, and the big LCD nods at all the modern conveniences even Porsche's fitting to its cars these days. Discerning between all the differently shaped ancillary switches can be distracting, but the large, clear gauges put the engine speed right in your sightlines. Autoblog: "virtually unchanged to the uninformed eye"
Car and Driver: "great interior"
ConsumerGuide: "many switches are undersized and hard to decipher"
Edmunds: "driver-centric Porsche 911 interior features a single-pod gauge cluster" ConsumerGuide: "gauges are closely placed and may seem daunting at first"
Whether it spins to 60 mph in less than 5.0 seconds or a little more than 3.0 seconds, every Porsche 911 breathes exhilarating performance. What you find in any version, after any amount of driving time, is that there's no practical way to approach the 911's grip limits on the street. The essential 3.6-liter flat six is the foundation; with 345 horsepower and a muscular engine note hammering away behind you, it'll push the coupe to 60 mph in 4.7 seconds and won't let up until it hits 180 mph. That's with the obedient, somewhat stiff-shifting six-speed manual. It's stout, and it needs to be for all this power. For our money, Porsche's new dual-clutch, seven-speed "PDK" gearbox is the better choice. It uses a pair of transmissions to pre-select gears for upshifts and downshifts, and it's faster than any driver with even the world's easiest manual shifter. "Auto" mode is enhanced with Sport, Sport Plus, and Manual modes-giving you as much choice in gears as you need. It shaves 0.2 second off the acceleration times of most any 911, but drops top speed to 178 mph. With the PDK transmission, the 911 achieves a mildly astonishing 19/27 mpg-a family-sedan fuel economy number. The 911 offers a few alternatives for even more performance. First up is the "S" model, powered by a bigger 3.8-liter flat six with 40 more horsepower. Its 0-60 mph times falls to 4.5 seconds; the PDK, all-wheel-drive, Cabriolet, and Sport Chrono options adjust speed accordingly. With a manual transmission, the 911S Coupe will top out at 188 mph. Our review doesn't cover two racing editions of the 911, the GT3 and the GT3 RS. Both have distinct powertrains and drive systems adapted for racing, down to a lithium-ion battery for track starts. In any 911, the ride can be tough and not at all pliant-the price paid of all relatively compact sports cars with huge tires. The reward comes in steering sensitivity and ultimate grip. No matter which model you're piloting, the brilliantly responsive 911 keeps the neural, connected feel it's always had-even in cars fitted with active suspension dampers (oil-pressurized, computer-controlled shocks-they're standard on S and Turbo versions, and available on 911). The 911 just steers better than any sports car, period. Sport Chrono mode doesn't mess with its inherent goodness-it dials up the drivetrain's intensity and clamps down on those shocks while they concentrate on staying flat and resisting body roll. Massive 18-, 19-, or 20-inch wheels give the 911 astounding grip, and some versions apply braking during tight corners to enhance their turn-in even more. The brakes, especially the bigger rotors on the Turbo and the optional carbon-ceramic discs, are like opening a parachute, and come with their own electronic assistants to make sure you get all the stopping power requested. Autoblog: PDK "perfectly suited to the Turbo"
Motor Trend: Turbo "feels like a good (and light) rear-driver at times, so sharp is its turn-in, so instant is its response to your instructions"
Motor Authority: "you'd have to provocate pretty fearlessly to get the Turbo to step a little sideways--and even then the electronics would sweep in to save the day"
Up front, the Porsche 911 offers a snug, well-built space-in back, it's one tight squeeze. For comfort, it's up to you to choose plusher seats for your 911. If it were our car, we'd skip the nicely firm manual-slide, power-rake seats and move up to the 12-way power seats. They have memory positions, good back support, and optional ventilation, and they feel better on longer trips than the base or the superfirm sport seats. Some seats have adaptive cushioning, and inflate or deflate some air chambers on the go-which seems over the top. The 911's upright style lends lots of headroom to the front passengers, but that lovely, long slope to the tail and the rear-mounted engine turn the backseats into child's play. They're token gestures, not even large enough for small children. Use them for luggage-there's also a weekend-bag space under the front hood-and you'll be able to take it on a couples' vacation. Cabriolet versions are fitted with an impressively snug top and equipped with a heated glass rear window. Putting the top down is a one-button affair that snugly retracts the whole thing in just a few seconds and sends it back up in a few more. Targa models have a large glass sunroof that glides back for a more open-air driving experience, though it still retains a roof structure. Autoblog: backseat is "bordering on unusable"
Motor Authority: "+2 seating in back is, as usual, a cruel German joke"
Cars.com: "backseat riders are in for a major squeeze"
Motor Authority: "roll-on-sized area under the front aluminum hood"
ConsumerGuide: "cabin materials are solid and mostly upscale"
The 2010 Porsche 911 doesn't have any official crash-test scores, but there's an excellent suite of safety features. Neither NHTSA (National Highway Traffic Safety Administration) nor the IIHS (Insurance Institute for Highway Safety) has crash-tested the 2010 911 lineup. Dual front, side, and curtain airbags are standard, along with Porsche's excellent PSM stability control system, anti-lock braking, and brake assists to boost the driver's inputs and to keep the brakes dry for optimal stopping power. There are no fancy safety gadgets like lane-departure warning systems, backup cameras, or active cruise control available-but the 911's sheer performance is a safety net of its own, as is the available all-wheel drive. Visibility is acceptable on most versions, but the low seating position and the sharp drop-off on the rear quarters will make you think twice about backing up in dicey situations. 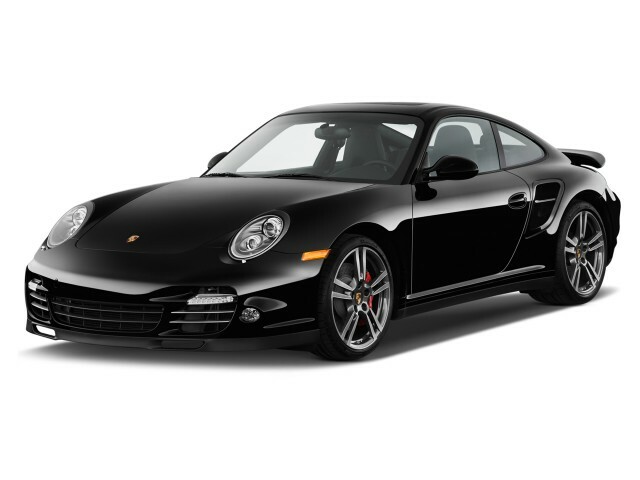 Incredible performance meets its match in the 2010 Porsche 911-in incredible options at incredible prices. For that price, Porsche fits all cars with standard climate control; power windows, locks, and mirrors; cruise control; a tilting/telescoping steering wheel; Bluetooth connectivity; and an AM/FM/CD/DVD player. Upgrades will turn a pragmatic 911 shopper into a pauper: Options include Bose surround sound; a DVD changer; an iPod interface; a voice-activated navigation system with a 40GB hard drive; a multifunction steering wheel; adaptive headlights; ventilated seats; and daunting choices for interior wood, metallic, and leather trim. The 911 Turbo acquires some of this stuff as standard, and gets distinct interior treatments with a leather dash and a sueded headliner. Our overall rating here accounts for the myriad options-and our opinion that things like iPod connectivity and navigation should come gratis in super-luxury-exotic machines such as these. Want more on the performance front? You can opt for the active suspension; Sport Chrono; the PDK transmission; carbon-ceramic brakes; 19-inch wheels; sport paddle shifters; the PTV torque-vectoring system; and stylish RS-look wheels with center locks. All told, a 911 Turbo could cost almost $160,000 with just the factory features-never mind Porsche's embrace of off-the-menu ordering for colors and trim. A timeless,legendary, driver's sports car. I purchased the 2010 911S used in 2013. the car had a few minor issues, but was delightfully overwhelmed with it's total presence,and performance. Although I don't drive it everyday, I enjoy every minute of... I purchased the 2010 911S used in 2013. the car had a few minor issues, but was delightfully overwhelmed with it's total presence,and performance. Although I don't drive it everyday, I enjoy every minute of the time I do spend on the road. 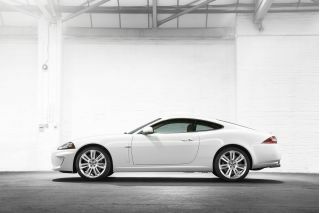 The comfort is excellent, the sound system is intensely flawless ; but often I drive it with the music off just to experience the sound of the engine.I had a Targa in the eighties, but prefer the coupe.